I've been playing with a few of the Google Mail Labs plugins over the past couple of months and this post is about my 'must haves'. There are three that I am very pleased with, which have changed how I use GMail to the point that it is now the only tab within Firefox that I MUST have open. This plugin shoves the labels section of the GMail page over to the right-hand side, meaning that you are not scrolling the page up and down to see your Inbox and your labels. 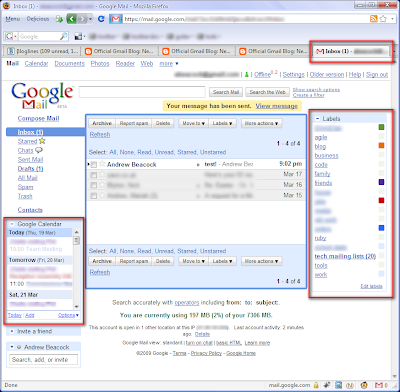 This tightly integrates Google Calendar into the left-hand side of GMail meaning that you can keep an eye on what is coming up without either having a seperate application running (which is sync'ed with Google Calendar) or another tab open. This is a recent addition (yesterday in fact) but looks quite useful - it simply rearranges the page title so that the selected folder (inbox, chats, labels, etc.) is first and so shows up on the tab. Thanks for pointing those out, Andy. I especially like the Right Side Labels feature. I'd also recommend the 'Forgotten Attachment Detector' ... if you're someone who occassionally forgets to add attachments. These are neat little tools. Have you looked at Tasks? It allows you to have messages with particular labels turn into 'todos'.